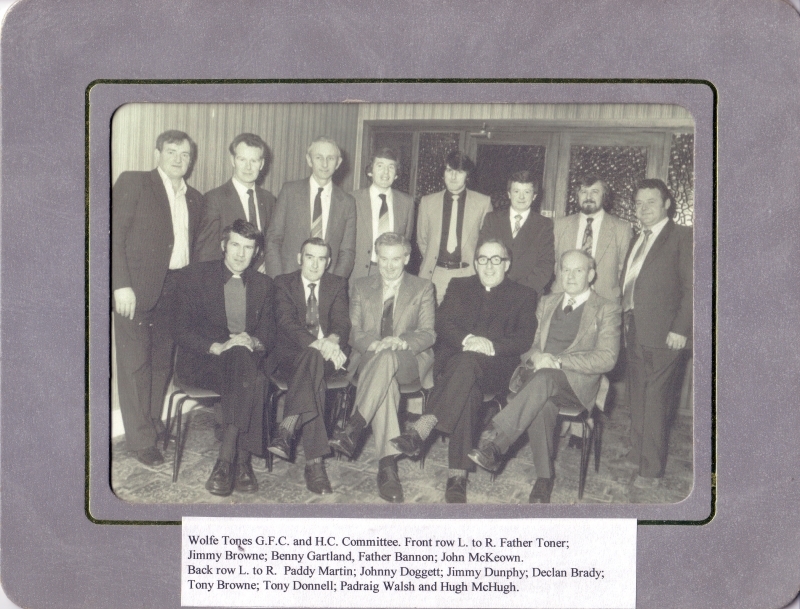 The formation of Wolfe Tones G.F.C. in 1975 in the parish of Oristown, which also includes Gibbstown, Kilberry and Wilkinstown, was a “dream come true” for many people in the area. Some years ago four football clubs existed in the parish at the same time – Gibbstown, Kilberry, Oristown and Wilkinstown – which also has a hurling team. 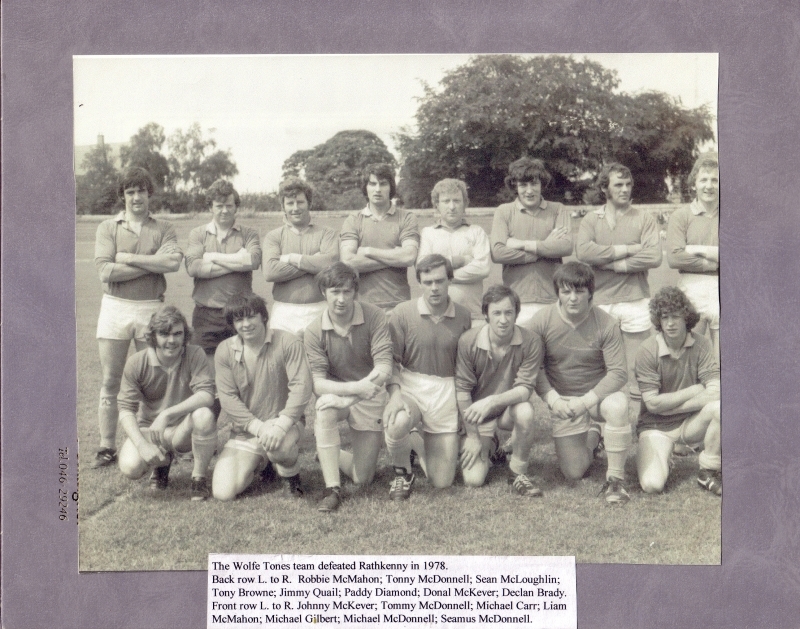 When under-age competition were introduced in Meath the teams joined together and were called at different stages, Kilberry and St. Catherines, Oristown. But when these youngsters reached adult age they separated. But though many far-seeing officials realised that an amalgamation would be in the best interest of football in the locality, this union took a long time to come about. Nevertheless, the various clubs in the area enjoyed a measure of success over the years. Kilberry, whose best known member was James Gilsenan, won two minor football championships defeating Kilskyre in 1955 and Donaghmore in 1957. A parish team under the name of Kilberry was beaten in under 14 finals in 1952 and ’53 by Ballivor. In 1963 Kilberry overcame Lougher in the junior B.F.C. final and thus atoned to some extent for the defeat by Kells in the ’51 junior decider. Christy Allen was a hard-working secretary for the club in the 1930’s. In the early days the jerseys worn by the Kilberry team were called “the stars and stripes” as they had a star in front of a striped jersey. Wilkinstown reached three junior championship finals but were beaten in all of them. They failed to Longwood in a football decider in 1939 and went down to Athboy and Moynalvey in the ’55 and ’62 hurling finals, respectively. The Oristown club, which was formed in the 1950’s lasted a mere four years. County Councillor Sylvester “Seb” Rooney was one of the better known members. The late Joe Curran from Wilkinstown, who was Liam and Robbie McMahon’s grandfather, was a former vice-chairman of Meath County Board and was captain of Castletown team which won two Meath championships between 1901 and 1908. The Gibbstown Club, which was formed in 1937, gained a junior B football championship title in 1968 beating Walterstown in the final but give years later they went down to Kilcloon in the J.F.C. decider. Some many years after its formation the Club lapsed but was re-organised in 1954 mainly through the efforts of Fr. Danny O’Neill. The late Mick Curley was a long serving honorary secretary while Michael Mullen, Willie Reilly and Billy Bowler also did great work for the Club. In 1965, following a dispute in Kilberry, another Club was formed in the area called Garryowen which lasted for seven years. But in 1972 Kilberry and Garryowen patched up their differences and formed St. John’s, Kilberry. 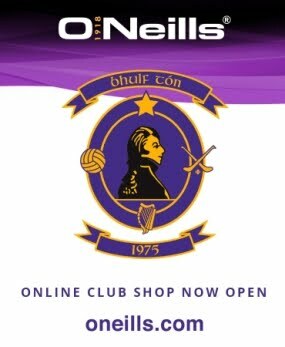 Two years later this Club won the intermediate football championship. The amalgamation which many had hoped for happened suddenly in 1975 when St. John’s and Gibbstown joined together to form Wolfe Tones G.F.C., Oristown. The first officers of the new Club were: Chairman, Joe McKeown; Vice Chairman, Jimmy Dunphy; Honorary Secretary, Declan Brady; Assistant Secretary, Michael Geraghty; Joint Treasurers, Padraig Heaney and Patsy Moriarity.